Looking for general antiquarian books? Biblio.co.nz hosts hundreds of of the finest online book stores and booksellers, including specialists in general antiquarian. Use the list below to locate a specific specialist bookseller or book store near you. Or, use the form below to search the inventory of all booksellers who specialize in general antiquarian. Specialists in literature, modern first editions and bound library sets, voyages and travel, colourplate and illustrated books, children's books, fore-edge paintings and fine and rare books in all fields. Adrian Harrington also provides a full and expert bookbinding and restoration service. Myrna & Lou Donato founded Amber Unicorn Books in 1981, prior to that Lou started Book Stop III in San Diego in 1970. Myrna specializes in Cook Books with over 16,000 cook book titles in stock. She also wrote an article on collecting cook books for the April 1994 issue of First magazine. We have a strong selection of Metaphysical/occult, Science Fiction/Fantasy, Military,General non-Fiction & Fiction. The Donato’s became ABAA Members in the mid 80's. SHIPPING TERMS: Orders usually shipped within 2 business days. S/H, USPS; Media $5.00, 1st. kilo (2.2lbs). $2.00 each additional kilo or part of. USPS: Priority Flat Rate, up to 10 lbs. is 12.00. Over-Night or Global, we’ll quote rates, we need your zip. All International orders are shipped Priority Rates. We will let you know the rate when you order. Rates quoted for Insurance, oversized books or sets and very heavy books. Astrolabe Booksellers no longer has a shop of its own, but does have stock available for perusal and purchase in The Antique Warehouse, 64 Warwick Street, Hobart, Tasmania (open 10am to 5pm, Monday to Saturday & 12-4pm Sunday).Astrolabe Booksellers is the leading antiquarian/ second-hand/used bookseller in Australia's island state. Proprietor Michael Sprod is a long-standing member of the Australian and New Zealand Association of Antiquarian Booksellers. Astrolabe carries a good range of antiquarian and second-hand books on a wide variety of subjects, specialising in works on Tasmania, Australia, Antarctica, Aborigines (especially Tasmanian), and maritime subjects. We have over 150,000 books in all subjects housed in our three story building. By appointment, at shows, and on line. Photos of the books available by request. Books available for view by appointment only. 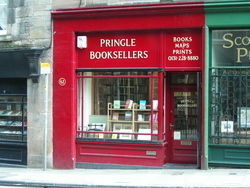 Full time bookseller since 1978.I check e-mail & phone queries frequently and endeavor to respond promptly. We are a small, open shop in Santa Barbara and have been in the same location for over 30 years. We have a select inventory of used and rare books. We also carry original posters and prints, vintage photographs and ephemera. Open Tues.- Sat. 11-6, closed Sunday & Monday. Fine books in all fields. 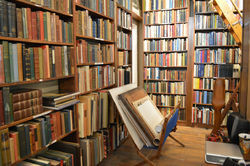 Main Street Fine Books & Manuscripts has been serving book lovers, collectors and institutions since 1991. Our inventory of quality out-of-print books spans 40 subjects, while the extensive autograph holdings have a decidedly historical bent, reflecting personages from every field of human endeavor. Orrin Schwab Books has been selling used and rare books full-time for 14 years. I specialize in Americana, Western Americana, Military, Childrens, and Historical topics of all time periods and regions. I also sell scarce and rare children's books and general antiquarian titles. Pages Past is a small used & rare bookshop located a few blocks from the University of North Carolina at Greensboro. Since 1996 we have been serving the Triad community as well as customers from around the world. We have around 15-20,000 volumes in our shop. We specialize in North Carolina, Virginia, Civil War, Old Leather, Christianity, Eastern and Western Philosophies, and the simply unusual. We very likely have the oldest books in Greensboro; we keep a nice selection of antiquarian volumes and scholarly books. Since 1969 we've been selling used and rare books. We're open 7 days a week. We have published 180 catalogues of rare, scare and interesting books in a wide variety of subjects, including.... Artic, Canadian History and Travel, The Americas, Ireland, General Antiquarian, and Military History. We have been established in Scotland's Capital City for twenty years and trade mainly from our retail premises as well as exhibiting at a number of Book Fairs throughout the year. We stock a wide range of books. We are members of the ABA ILAB and PBFA. A brick and mortar store in Pittsburgh's beautiful Shadyside neighborhood with over 5,000 books across all fields. We maintain a select inventory of fine bindings, multi-volume sets, and general antiquarian books and related materials in a shop-like setting in our home. Visitors welcome by appointment. 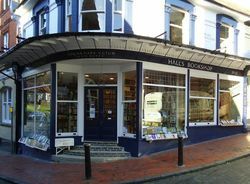 Tavistock Books, established in 1989, specializes in First Editions, Antiquarian Rare & Collectible material with a special focus on Charles Dickens. We maintain a stock of 15000 volumes, which may be seen by appointment or by chance when you are in the greater San Francisco Bay Area, or by browsing our Web page @ www.tavbooks.com. Tavistock Books is a member of the Antiquarian Bookseller\'s Association of America, the Independent On-Line Booksellers\' Association, the Bibliographical Society of America, the Bibliographical Society of the University of Virginia, the American Printing History Association, the Roxburghe Club, and the Book Club of California.